Does Olive Oil Tenderize Meat? Olive oil is one of nature's healthiest foods. Olive oil contains heart-healthy omega-3 fatty acid; for this reason it's called a "good fat." You can use olive oil in a variety of ways, from a salad dressing to a marinade component for your favorite protein. Olive oil alone won't tenderize your meat, but when added to other ingredients, it gets the job done. Tenderizing meat is a process also called denaturing. Certain substances that come in contact with the surface of the meat break down the protein structure of the meat a bit. The Science of Cooking describes this process as opening up "tunnels" in the meat to let in flavor. Usually, acids are responsible for the tenderization of meat. Lemon juice, vinegar, tomato products, yogurt and wine all have an acidic base that can help tenderize meat. Olive oil is responsible for the flavoring of meats that have been denatured. The oil helps deliver the flavor of the acidic content to the inner channels that have been exposed from marinating. Although olive oil is not a natural tenderizer, it's often used in marinades to keep poultry, beef, pork and fish moist. Over-marinating meats with acids can sometimes dry them out. Olive oil counteracts this potential reaction. A little bit of marinade goes a long way when tenderizing chicken, pork or steak. You'll only need about a half a cup of marinade for each pound of meat. Marinades generally comprise predominantly acid and spices, with just a drizzle of olive oil. Leaner meats will need more oil than fattier cuts. Handle olive oil-based marinades safely to prevent illness. Throw away any unused tenderizers that come in contact with uncooked meats, as they could be contaminated with bacteria. Some oil-based sauces, however, provide more flavor to a cooked dish. If you want to use the marinade as a sauce after cooking, make a fresh batch to ensure the health and safety of your family. Science of Cooking: What Gives Meat Its Flavor? 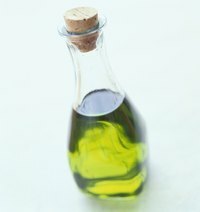 MayoClinic.com: Olive OIl: What Are the Health Benefits? What Happens If You Eat Nuts That Have Gone Bad?